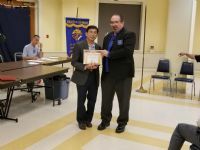 Congratulations and Thanks to June's Knight of the Month Brother Dave Wilson! Dave organized the Council's recent document shredding day at St. Raymond's. 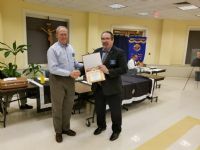 Barry Ryan is the Knight of the Month for May. In addition to the responsibilities as Deputy Grand Knight, Barry also coordinated the KOVAR fundraiser and the recent Parish Blood Drive. Congratulations Barry and Thanks! October Knight of the Month is Doug Stormont. 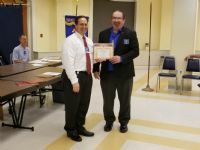 Doug completed many years of service as the coordinator of our Council's blood drive with another very successful drive in October. Thank you Doug for a great job and for helping to give the Gift of Life! 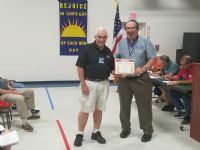 Congratulations and thank you go to John Minear who generously volunteered his time to several events and projects last month, including the picnic table restoration and the Parish picnic. 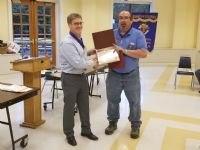 Joe is recognized as Knight of the Month for May due to his "double" and "triple" duties for KOVAR. Whenvever we had open slots for our KOVAR assignments, Joe would step up and handle double duties at the Giant and double duties at the Masses. Thanks Joe for making KOVAR a tremendous success. 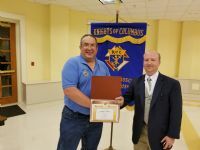 Chuck is recognized as Knight of the month for April for his never ending help at all Knights events. Chuck and his wife, Caterina, helped at the Italian dinner. Chuck regularly attends our meetings and gives suggestions on how to improve our outreach to the parish. Chuck also is a member of our Men's prayer group and is very active in our Cursillo group at church. Congratulations Chuck and Thank You. Pat is recognized as Knight of the Month in March for his direction of the St. Patrick's Day Dinner. Pat was in charge of the dinner and as usual, it was a great success. Pat is our Deputy Grand Knight, EM at church, CCD teacher and a member of the finance committee. Thank you Pat for all your hard work. Buz is recognized for his coordination in putting on Breakfast with Santa. Buz helped with the setup, cooking, assisting the youth with their assignments and clean up. Thanks Buz for all the hard work for this event. 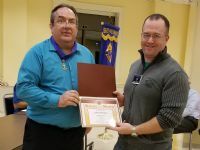 Bill is awarded the December Knight of the Month. Bill is our recorder and stepped up to this task when we were in need of help. Bill assists at the "spirits" table for every dinner and is a huge asset to our council and parish. Mike coordinated the Octoberfest Dinner and it was a huge success. 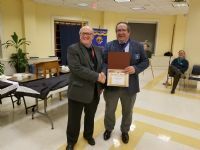 Mike is a past Grand Knight and is always available to assist and help with all our events. Thanks Mike for helping, even though you were selling a house and moving. John always "steps up" to help. He assisted on the grill at the parish picnic and also played guard duties at the state meeting. 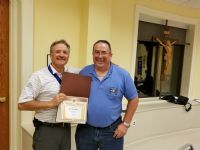 John is a wonderful asset to our council and has provided excellent guidance to the new Grand Knight.